The greatest liberation of the history of humanity is in progress. New technologies, such as robotics and artificial intelligence, will put an end to the enslavement of human beings through work and money. The current troubles and unrest that can be expected to worsen are a sign of the collapse of capitalism and the free market that can not equitably distribute the fantastic productivity gains that our technology today allows. The owners of the machines monopolise wealth while the rest of the population sees its purchasing power diminish and its employment gradually disappear unable to compete with the power, expertise, availability and cost of machines getting smarter and smarter. Tomorrow the only jobs we will create will be for the machines. And that's a positive. A human being should not have to do what a machine can do. 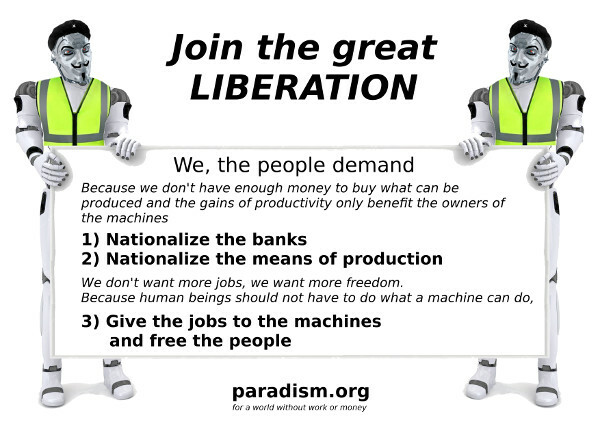 Paradism, the new society that is coming will be a society without work or money. Paradism is the system of society of all technologically advanced civilisations where human beings are free of their time and do only what they enjoy doing: play, create, meditate, blossom ... and of course make love, free from all judgement and guilt. It is the system of society of a paradise. On May 1st, the Paradist movements around the world celebrate the International day of Paradism. This year, the activities that will take place all over the world - conferences, interviews, diffusion in the streets and online, meetings and assemblies – will aim at raising the awareness of the necessity to nationalise the means of production to restore peace and social justice in a society that is robotising. The nationalisation of the means of production will allow the whole community to benefit from the gains of productivity, put an end to the shocking and rapidly growing wealth inequalities and will make possible the society without work or money. When a community owns all the robots that do all the work, there is no need for money since everything can be free. The nationalisation is therefore the important part of the solution but is never coming out in the protests and the political discourse. Such is the importance of our sensitisation of the population. We are the generation that has the privilege and the immense responsibility to make the transition to paradism and to avoid a collapse that can lead to the destruction of life on earth. This transition, which is also a liberation, is our duty and our responsibility for future generations. humanity and turn this earth into a paradise.